Lindsey Vonn speaks at a news conference on Tuesday, Feb. 5, 2019, after she crashed during the women's Super G event of the 2019 FIS Alpine Ski World Championships at the National Arena in Are, Sweden. Actor. Businesswoman. Mom. Heck, maybe even all three. 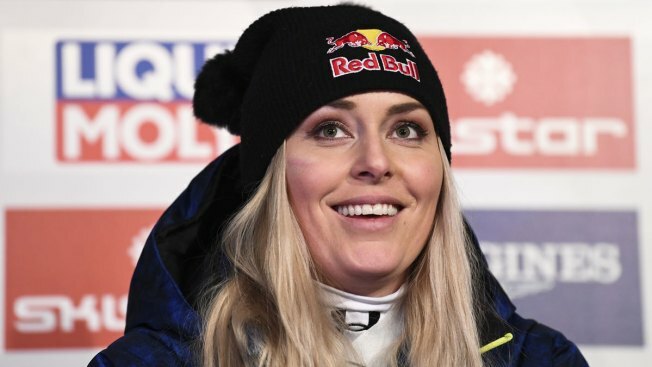 Life after skiing is already taking shape for Lindsey Vonn and she has not even competed in her last race. "Next goal, take on the world," Vonn said, perhaps jokingly — but who'd put it past her? — when discussing what the future holds for her when she retires after the world championships in Sweden. One thing's for sure: She's unlikely to be slipping out of the limelight. Lindsey Vonn became the oldest female downhill skier to earn an Olympic medal in the event with her bronze medal-winning run on Wednesday. After the race, Vonn said it would be her final Olympic downhill. "I'm a driven person," said Vonn, who has 1.6 million Instagram followers and, at the height of her career in 2013, was worth $3 million, according to Forbes. "I'm not going to be sitting on the couch, twiddling my thumbs. That would be boring. It's all about pushing myself." Just like it was all or nothing in her record-setting skiing career— her current shiner around her right eye and the highlight reel of crashes are testament to that — Vonn intends to immerse herself in lots of things once she puts away her racing suit. She said she'll be setting up her own business, which involves a "new project" that she is keeping under wraps for the moment. Attending a four-day course at Harvard Business School last year was an early signal of her post-skiing intentions. "I hope one day," Vonn said, "they say, 'OK, she was a skier a long time ago, and now she's a successful businesswoman.'" That would be a big deal for Vonn, who has previously referred to being "self-conscious about my level of education," having never been to college. Her family moved from Minnesota to Vail, Colorado, when she was 12 to advance her skiing career, and she took online courses to complete her high school education. Vonn would do well to take some advice from American teammate Ted Ligety, who is also 34 and who founded his ski accessories company , Shred, in 2006. What Is Lindsey Vonn Drawing? Lindsey Vonn is one of the best skiers in the world. But how good of an artist is she? See if you can guess what Vonn is drawing. "It's a whole other world," Ligety told The Associated Press. "It's never easy ... You can't do it yourself. You got to have some help along the way and have some people that know better and that can help you carry out a vision as well." Vonn also is looking to get into the world of movies, both in front of the camera and behind it as an executive producer. She has already been an extra on one of her favorite shows, "Law & Order," and in December launched her own YouTube channel, LVTV, where she provides weekly lifestyle content on things like health, fitness and cooking. It's therefore no surprise that being a mother is not immediately on her agenda, but she definitely plans to have kids somewhere down the line. If her boyfriend, Nashville Predators defenseman P.K. Subban, wasn't already aware of that, he is now. In her news conference Tuesday after the super-G race at the worlds, Vonn set up her cell phone on the table in front of her to ensure Subban could listen in live. "Wait, I've got to make sure my boyfriend is here for this," Vonn said, repositioning her phone. "Yes, of course, I'd love to have children. U.S. alpine skier Lindsey Vonn tweeted on Wednesday that she forgot about Valentine’s Day. "I'm 34, so I can't wait too long," she added before looking straight down the phone. "You know what I'm saying." She said one of the reasons she is calling an end to her sports career now is so she doesn't damage her body even more, to the extent that she wouldn't be able to go skiing with her own children. She'll be making a clean break from the sport, too, after the downhill on Sunday. Not even coaching. "I want to be still here, racing," Vonn said, "I accept that I can't, but I still want to be here. If I was going to be involved in skiing at least for the next few years, I think that would just make me even more sad. I need a break. Maybe after time, when I'm older, maybe then I can make my way back." Throw in her foundation and her slew of well-known sponsors that she plans to continue representing and Vonn won't have a problem keeping herself occupied. Top of the to-do list when she returns to the United States next week will be to have a seventh, and hopefully final, operation on her knee after tearing her lateral collateral ligament in November. During rehab, Vonn will have time to figure out exactly how to attack the next stage in her life. "My head is still good," she said. "That's all I need at this point."